Available now on Amazon in 256GB and 512GB sizes, 1TB not expected until early next year. These past few hours, I've been quite enjoying doing some basic tests of my two new 950 PROs, 512GB capacity, ensuring I'm getting expected performance levels. I short, I am! This first series of tests use Windows 10, using two 950 PRO 512GB model MZ-V5P512BW SSDs at the latest firmware 1B0QBXX7. 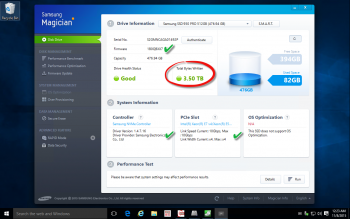 The next series will cover a Windows 10 VM running on VMware ESXi 6.0 Update 1a. I won't be using this Samsung 950 for exclusive Windows 10 use for very long. Its fate is a quick secure erase, then combined-use as both vSphere Flash Read Cache, and as a VMFS datastore. It's all explained in my storage plan, along with my Samsung 850 EVO 2TB for laptop/VM multi-boot. Just one day of many tests. Lifetime of SSD is 400TB written. I would suggest you avoid benchmarks that do writes and run for hours or overnight. Just don't go nuts with those artificial write tests, and you'll be fine for years. These results are looking quite favorable, highlighting the power of the efficient Intel Xeon D-1540 SoC. This is a compact motherboard at 6.7"x6.7" (17cm x 17cm), with an integrated octacore Xeon that operates at around 45 watts. For these tests, I'm just using one tiny drive, the Samsung 950 PRO. It can only consume at most 7 watts, but sips only 70mW when idle. Idle is where most of its time is normally spent. 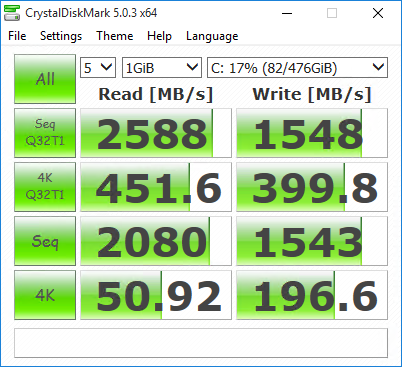 Think about how little time SSDs are used during normal use, given how fast they read and write those tiny files touched as you use Windows for productivity tasks. These synthetic benchmarks are exactly that, synthetic, but are very useful to help us know if we're getting the expected performance out of our hardware investments. I realize these aren't perfect tests, no benchmark is. I also realize many purists would want to change to higher queue depths or even more repeated runs. The thing is, I need to use this hardware very soon, and I don't plan to gobble up too many TBs of those 400TB lifetime of writes, just because. This is not an evaluation. This drive is a keeper. 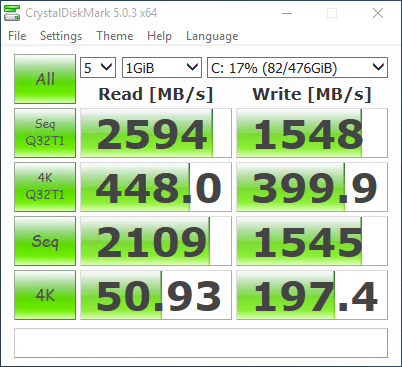 My goal began mostly just to determine if the Intel 750 Series or this drive is better for my needs. But it quickly became apparent that I should go ahead and document my simple tests, so that other SuperServer Bundle 1, 2, or 3 owners can easily obtain very similar results, knowing they too are getting the expected performance that matches or exceeds the manufacturer's claims. These instructions are only valid for this particular system, your results will likely vary on other systems. your performance will be more than 90% of what you see here, but your CPU will also be able to step down to 0.78GHZ when the system is idle, saving you watt burn. That's what I'll be doing, turning those conservation settings back on, as soon as I'm done with these tests. Now that I have these tests done, I'll also be re-running these same 3 utilities against an Intel 750 Series 400GB that I (temporarily) still have. I also tinkered with likely scenarios such as running 2 950 PROs through 2 instances of ATTO Disk Benchmark, simultaneously. That PCI 3.0 bus held up quite well, with both 950s getting about 75% of the speed they'd get if they were the only tests running. Not something you'd likely see in the old SATA3 days. NVMe is light on CPU too. So far, comparing this drive to my recent Intel 750 Series and Samsung SM951 tests, it's sure looking like this one is tops for my needs. That "Best Consumer SSD in the world" phrase I've seen seems well deserved. Let's cover the basics, the way I set up my tests of the Samsung 950 PRO. If you just want pictures/results, jump below. Benchmark Optimized BIOS configuration video that follows along with the Step-by-Step instructions below. It will warn you about video settings needing to be saved first. Go to "Save & Exit" tab, Save Changes and reboot, then resume at this step. Fan Mode "Set to Full Speed"
SuperDoctor was used only to see if there was anything interesting going on with component temperatures during the trial-runs/setup, with a roughly 15 second refresh interval. You could do this via IPMI and browser refresh too. SuperDoctor was not used for the actual benchmark tests. 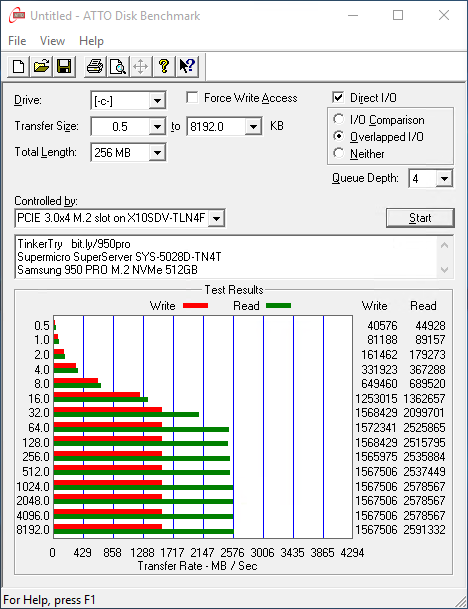 no other utilities were used for the screenshots below, the thermal measurements from Supermicro SuperDoctor 5 seen in the top-most picture above this article were from my early tests, monitoring the system while benchmarking just to learn a bit more about how the system responds. Simple, graphical test that shows sequential transfer rates at various file sizes. 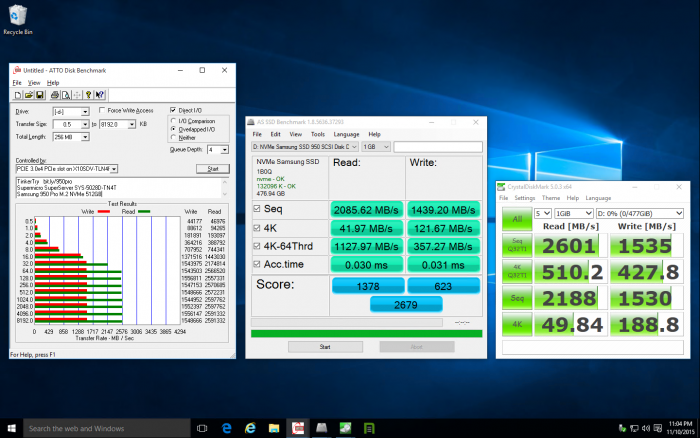 The speeds at 4K are most important for a Windows boot drive. 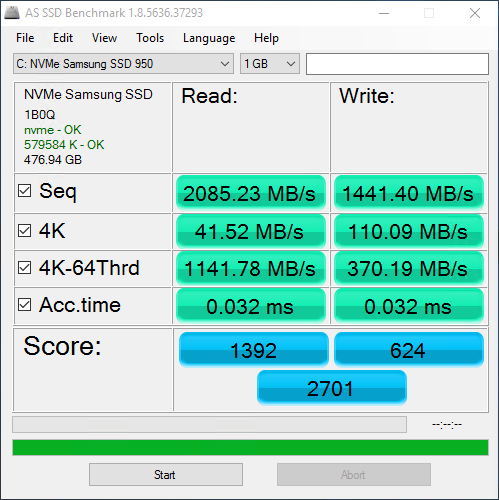 The AS SSD Benchmark determines the performance of solid state drives (SSD). The tool contains six synthetic and three copy-testing. The synthetic tests determine the sequential and random read and write performance of the SSD. These tests are conducted without using the operating system caches. Single click test reveals the read and write performance of incompressible data. Drive C: - of each of the 3 runs of the 3 tools, I took the best ones, shown here, based only on the single highest read speed. It's apparent after yesterday's tests that optimizing of BIOS helped a bit, gaining somewhere under a 10% boost. For me, it's not worth running CPU at near full GHz 24x7 for that small boost. Drive D: - of each of the 3 runs of the 3 tools, I took the best ones, shown here, based only on the single highest read speed. The results are nearly identical, so using the PCI adapter doesn't seem to affect speed in any substantial way. Fan speed was kept high, and there were no thermal slowdowns noted. even when showing symptoms of possible thermal throttling, the 512GB sustained respectable performance and in tests that were representative of interactive use it performed extremely well. 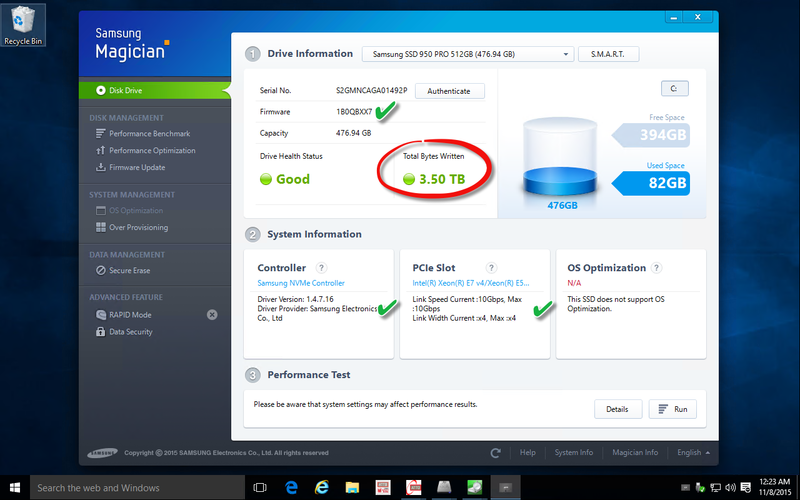 Users waiting on a full range of Skylake systems to come to the market may need a PCIe to M.2 adapter in order to put the drive in a slot that provides four lanes at PCIe 3.0 speed, but with the added benefit that such adapters can be bought with heatsinks to reduce the chance of triggering thermal throttling. In this video you will see a continuous video with no cuts, demonstrating a speed dip in the middle of the 2nd ATTO disk speed benchmarking test, which Samsung calls Dynamic Thermal Throttling Protection. Quickly remedied by simply changing the chassis fan speed from low to medium just for benchmarking. I put mine back to the default low setting for 24x7 routine/normal use. For the bigger transfers, speed barely impacted at all. CPU is at 17% for small files near the beginning of the test, spiking to 26% very briefly, then below 5% for the bigger files. NVMe on PCIe 3.0 x 4 really shines here. CPU temp. rose from 38C to 46C, no other motherboard component rose more than roughly one degree. These findings are impressive. Third party video showing Samsung 950 Pro vs Samsung SM951 Thermal Comparison. See also the single M.2 to PCIe 3.0x4 adapter that I have just tested, at a cost of roughly $20 USD, that doesn't come with any heatsinks. Would I really want to peel off that big sticker, and what would that do to my warranty anyway? This particular adapter is one of the "Frequently Bought Together" accessories for buyers of the 950 PRO on Amazon. There are pricier options with heatsinks, such as this Bplus M2P4A on Amazon or Newegg. 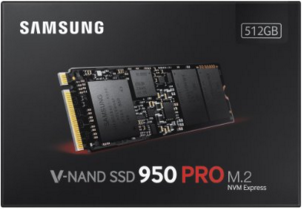 If you wish to read a little more about my initial testing, head to my How to boot from NVMe article here. Brief iperf3 demo, showing 2.53 Gbps speeds moving data from one SuperServer to another, running Windows 10. This is a network test, not a disk test. If you're interested in trying iperf yourself, read more about it then download. The iperf test just finished, but the Task Manager hasn't quite noticed yet. Notice the nicely shaped histogram, a good sign of network health. 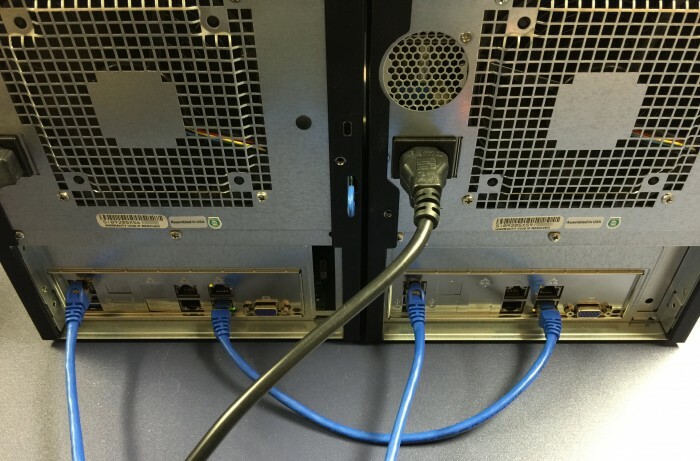 You can see the CAT6e cable going directly across [X552 10GbE NIC does auto-crossover]. The other 2 network cables are for management via iKVM for remote GUI used in the video above. This is not a sponsored post. I had been planning to do this testing for months now. The 2nd 950 PRO that I borrowed for this test was identical to the first, also from Amazon. My systems and my SSDs were all purchased, I just didn't have a 128GB maxed out system with a 2nd 950 PRO of my own to do these tests. Your purchase of this this same exact same SuperServer uses a Wiredzone affiliate link. Includes a description of Dynamic Thermal Throttling Protection.